An ancient sage once foretold, “China would be destroyed by a woman.” Historians described Empress Tzu Hsi of the Qing Dynasty as an evil leader hell-bent on the usurpation of power. This much-documented image later served to affirm the age-old prophecy. 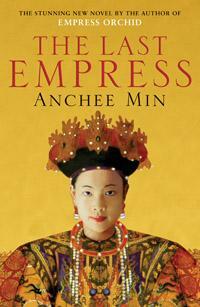 The Last Empress by Anchee Min is the sequel to the acclaimed _Empress Orchid _(2004). Set towards the end of Imperial China, Min continues the heartbreaking tale of the country’s downfall at the hands of merciless foreigners. Tzu Hsi or Orchid, as she is previously called, first enters the Forbidden City as a concubine then reluctantly but out of necessity gains control of the throne after the Emperor’s premature death. Contrary to history’s cruel depiction of China’s central female figure, Min successfully weaves a portrait of a woman whose love is bountiful as a mother and a ruler. The Empress portrayed in Min’s novel is truly human and is liberated from her profound demonization. Adhering to strict traditional codes, Orchid remains a life-long widow. Prohibited to enter another relationship, her objective becomes to raise her son Tung Chih as Successor. The story not only illustrates female oppression, but also demonstrates the brutal treatment of eunuchs—the palace servants who are castrated from an early age to ensure that concubines and wives produce the Emperor’s “seeds” alone. No one is to be trusted inside the Forbidden City. Bribery and betrayal is common amongst the eunuchs and the threat to Orchid’s survival is often. Steeped in tragedy the author crafts a fictional account of the Empress’s private character and life, challenging the prevalent conception of her as a bloodthirsty monster and thereby restoring a sense of her dignity. Rather than causing the empire to crumble, as is history’s assumption, Orchid tries desperately hard to maintain order despite outside invasions and internal rivalry. Through her strong will, wisdom and self-sacrifice, she single-handedly holds the dynasty together by its remaining threads. Told through first-person, the narrative is written in beautiful prose bordering on the poetic. It provides an insight into late 19th and early 20th century Chinese culture and politics and unearths a deep power struggle between the sexes and, indeed, against Western Civilisation. Engaging and intriguing, The Last Empress has the feel of a memoir. Lovers of Memoirs of a Geisha would relish this rich historical fiction that will make you think twice about accepting the male view of history as truth.